Jurassic World: Fallen Kingdom contains several E.T. Easter eggs that you might have missed. Director J.A. Bayona paid homage to Steven Spielberg quite a bit with his entry in the Jurassic Park franchise. 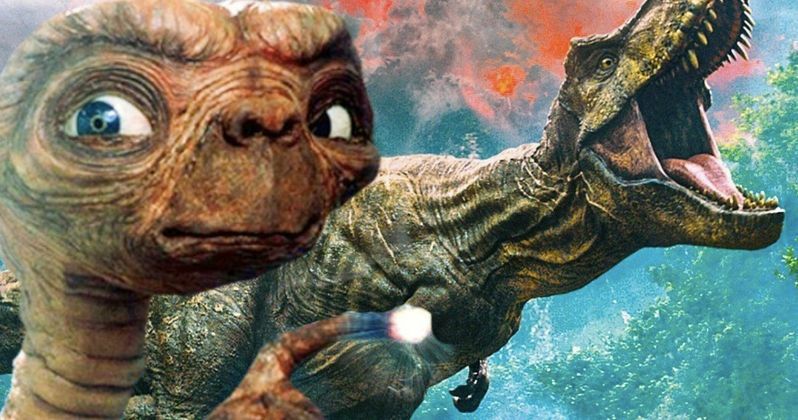 Not only did he included quite a few nods to the original movie that started the multi-billion dollar dino series, but he also decided to include several nods to one of Spielberg's other classics, E.T. the Extra Terrestrial. Warning: spoilers ahead for Jurassic World: Fallen Kingdom. During the third act of the movie, which takes place at the Lockwood Estate in California, there's a scene that features the Indoraptor terrorizing Maisie in her bedroom. Owen eventually saves her and there's a lot of distracting, scary dinosaur stuff going on to distract the viewer from going on an Easter egg hunt. But as J.A. Bayona points out in a recent interview, there is an E.T. toy hidden in the room. Here's what he had to say about it. "In the dinosaur fight in Maisie's room, there's a lot of toys. And if you take a look at the toys, you will see there's an E.T. character there. You try to have fun, but at the same time you try to integrate that nostalgia into the story you're telling." Another reference to Steven Spielberg's 1982 sci-fi classic comes in the form of Maisie's wardrobe. Her red sweater is meant to evoke what Elliot is seen wearing in E.T. "That's very Amblin, very Spielbergian," Bayona said. The final reference to E.T. is arguably the most impressive and probably the toughest to spot. At the very end of the movie, as the dinosaurs have escaped into the world and are now free to live side-by-side with humans, we see Blue overlooking a neighborhood. That neighborhood as some major significance has it's the same one that was used while filming E.T. all those years ago, Bayona explains. "You see Blue, and Blue is on top of this hill. And what you see is the same neighborhood where they shot E.T. I think it's great when you can make a connection with the other films because we have very emotional relations with these movies. We saw them when we were very young or when we were kids." While Jurassic World 2 may not have done the trick for critics, it's certainly working for moviegoers as it's already pulled in $934 million at the worldwide box office. That will help pave the way for Jurassic World 3, which is already set for release on June 11, 2021. What Steven Spielberg works will director Colin Trevorrow choose to include in the next installment? We'll have to wait and see. Though not a Spielberg creation, they're really missing out if they don't slip in at least one Planet of the Apes joke, given where the plot is probably taking us. This news comes to us courtesy of Yahoo.